Zukalova Counselors At Law is an attorney office comprising young, enthusiastic and dedicated lawyers. Our lawyers' key practice areas include commercial business advisory, litigation, Slovak and European Labour laws and free movement of persons. We deal with complex issues of law and jurisdiction often involving the association with government agencies and commercial organisations, national and international. Our clients include corporates and individuals. The legal advice offered by us, is based on a thorough and focused study of law, case studies, business legality and our rich experience in many spheres. We are a client-oriented firm, which comprehends and analyses the issues arising from the outlook of both, the individual or corporate and the existing legal issue. In addition to this, we also try to identify the root cause and take preventive measures to curb a similar situation which might arise in the near future. JUDr. Dagmar Zukalova and her competent team provide legal service to their clients in Slovak and English language. 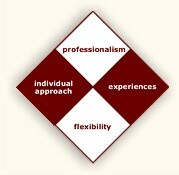 Lawyers at Zukalova Counselors At Law are skilled in practicing Slovak and European laws as a team and independently. A lawyer is not only identified with the practice of law. The ability to trace the stream of business of the client and interplay with varied sectors of economy fosters us to be progressive, learning and open to changes in the society. Hence, a lawyer is a versatile player. Lawyers at Zukalova Counselors At Law bring with them best quality and unrivalled experience from varied business sectors. Dagmar Zukalova and her team constantly work for large and international corporates as legal advisors. The team acknowledges the fact that the decisions and advices practised by them largely impact the people and this necessitates them to be meticulous and professionally equipped with fair and sound practice of law. Every client is different and so are the legal cases. A solution may vary for different clients. A small company with few employees and an international corporate cannot be treated by similar advices. Therefore, our approaches may differ to provide the best quality.